Key West sailing vessel schooner Wolf, Florida Keys. Sail away aboard the flagship of the Conch Republic, a 74 foot topsail schooner. A 74 foot wooden schooner that sails in Annapolis, Maryland for public sailing tours, private charters, special events and overnight accommodations on the Chesapeake Bay. 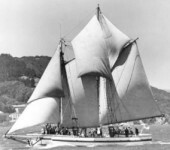 The Schooner Zodiac is a 127 foot sailing ship listed on the National Historic Register. She is available for charter in the Pacific Northwest. 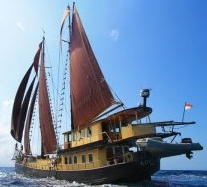 Dutch built (1902) schooner operating as a liveaboard for cruises and diving around Komodo, Indonesia. The Black Dog Tall Ships - Martha's Vineyard MA and Newport RI - Schooners Shenandoah and Alabama. Designated a National Historic Landmark in 1988, Alma is now part of the San Francisco Maritime National Historical Park’s fleet of historic vessels at Hyde Street Pier. She sails every season, and participates in the revived Master Mariners Regatta every May. Schooner charter and cruises on the Chesapeake Bay east coast. The Friendship Sloop Lisa K.
The 31-foot Friendship Sloop Lisa K. cruising out of Mystic, Connecticut. The vessel is a fiberglass replica of the original "Dictator" built in 1904 by Robert E. McLain. The replica is one of a few dozen built by Jarvis Newman and finished by Bruce Lanning in 1980-81. 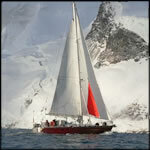 A New Zealand based expedition sailing vessel for charter and research expeditions. The only original three-masted schooner in the famed Maine Windjammer fleet. She is the largest passenger sailing vessel under the USA flag, yet this historic schooner accommodates just 40 guests. Rockland, ME. A classic racing yacht of the 12mR class. These yachts are often referred to as "Twelves" or "12 Metres". The 12mR class rule was defined in 1906 and was used until 1987 to create some of the most competitive racing yachts of their times. A new “12” built to celebrate the centenary of the founding of the International Yacht Racing Union’s rule for Metre Boats. A conference in London in 1906, attended by all the major yachting nations (excluding the United States of America, which had its own Universal Rule) paved the way for this then new breed of yacht. One of six nearly identical 12mR yachts built by Abeking & Rasmussen in 1928, based on the design of W. Starling Burgess and currently undergoing a full restoration. Offers information on sailing along on this one and only authentic Dutch threemaster. Her homeport is Rotterdam, from where she started sailing cargo in 1918. She is the largest Dutch restored sailing ship and sails all around the world. A yacht for those who love the smell of the sea and who travel with Hemingway in their hearts, Attimo has a modern design and has been built with contemporary materials. Dédié à ceux qui aiment le parfum de la mer et qui voyagent avec Hemingway dans le coeur, Attimo est conçu avec des lignes et des matériaux contemporains. A 71 foot ketch offering crewed sailing expeditions to the Caribbean, Azores and Cape Verdi Islands amongst other destinations. A Super-Maxi yacht combining high performance and cutting-edge technology with the ultimate in charter and corporate charter luxury in the UK, Med and Caribbean. A 100 year old sailing ship made from steel circumnavigating from 2004 onwards.